Stock up and cool down with an upright freezer that is made to store large quantities of frozen foods. Similar in size and appearance to a standard refrigerator, the upright freezer offers maximum storage for frozen goods and can easily fit in many kitchens, garages, basements and more. Unlike a chest freezer that requires you to reach down inside, many people appreciate the easy accessibility offered by an upright freezer’s shelves, drawers, and door bins. Upright freezers range in size from compact to large capacity—it’s not uncommon to see models as small as 2 or 3 cubic feet ranging up to larger appliances with 20 or more cubic feet of storage space. Just like other kitchen appliances, you can choose from models with black, white, or stainless steel finishes. One other important consideration you’ll need to make is whether to buy a frost-free upright freezer or one that requires manual defrosting. Whether you want to stock up on freezer meals or frozen goods, an upright freezer is a convenient appliance option. Not sure where to start your search? 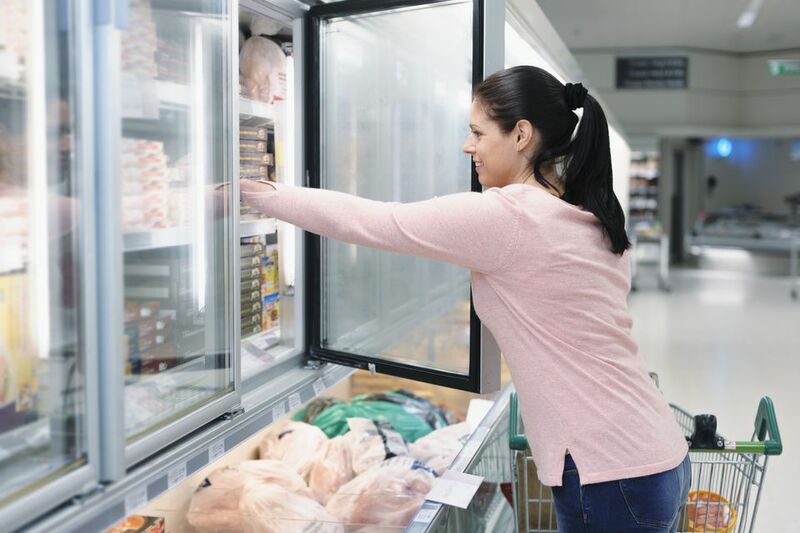 Here are the top-rated upright freezers on the market today. An upright freezer should offer enough room and plenty of chill power to keep your food frozen solid yet easily accessible. If you’re in the market for an upright freezer, the Kenmore Elite 27002 is our top pick. Choose from a roomy 20.5 cubic foot model or a more compact 16.6 cubic foot option. This practical choice for deep chill food storage comes equipped with Fresh Freeze technology, which holds the internal temperature at -20F. While these chilling temperatures aren’t only unique to this Kenmore Elite model, it should be noted that not all upright freezers offer this level of deep freeze. An express chill option also helps to cool things down to arctic levels at an accelerated rate – which is useful when you’re adding a lot of fresh food to the freezer at once. When it comes time to thaw out the appliance itself, it’s equipped with an automatic defrost function. People definitely appreciate the ‘Soft Freeze Zone’ on the door that keeps ice cream or other items safely frozen but not hard as a rock. You’ll be able to wedge your scoop into the container without needing to chip away at a concrete-like block of ice cream to get to your treat. Another popular feature on the Kenmore Elite 27002 is the digital temperature display located front and center on the appliance, along with the alarm that will alert you if the door is left ajar. Both of these features give users peace of mind that their stockpile of frozen food is being securely stored at all times. For easy storage of your frozen goods, the Kenmore Elite 27003 is a mid-priced model with all the necessary features and a slick appearance that will look good in your kitchen, garage, basement, or anywhere else. Choose from a stainless steel finish or classic white exterior. Don’t burn up cash shopping for an ice-cold appliance – save money with a budget upright freezer. The Whirlpool WZF34X16DW is an affordable option if you’re in the market for a basic upright freezer. This Whirlpool model offers all the functionality you need in an upright freezer but skips the fancy features and shiny looks that higher-end models offer. A fast freeze function will cool things down in a hurry and an auto-defrost feature means that you won’t have to schedule time to manually defrost the freezer. A reversible door makes it easy to fit this freezer in your space. 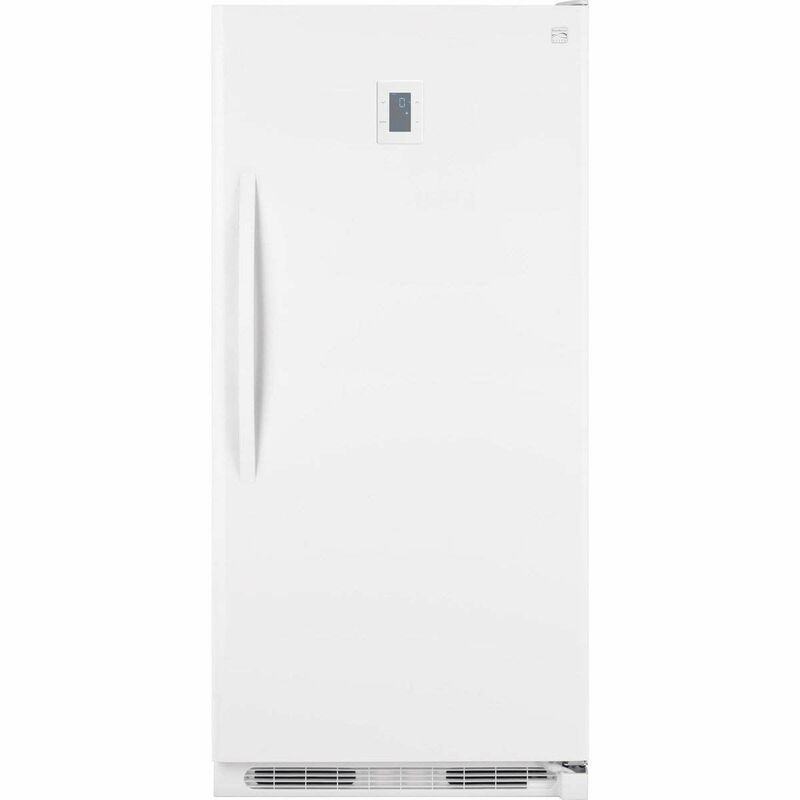 The 15.7 cubic feet of food storage space is less than some other full-size upright freezers, but the appliance earns 4.5 stars by more than 1,000 reviewers and is a suitable size for average household needs. It’s practically laid out with three adjustable wire shelves and five door shelves. The temperature controls are front and center for easy access to the 3 different settings. Some people were disappointed that there is no temperature display inside the freezer – you’ll need to buy a thermometer if you want to keep closer tabs on the temperature. According to users, this budget upright freezer runs quieter than many other models. Overall, the Whirlpool WZF34X16DW covers all the bases at a price point that is a home run for a full-size upright freezer. If your upright freezer is front and center in your home, consider the Electrolux Upright Freezer. This sleek stainless steel appliance has all the necessary components to keep your stocked frozen foods safe, but looks worthy of a place in any gourmet kitchen. The stainless steel exterior of the Electrolux Upright Freezer features a framed door finished with a rounded handle for easy opening. You should know that the front of the fridge isn’t magnetic—meaning you’ll have to hang the kids’ artwork and reminders somewhere else. But for a clean look in the kitchen, this high-end upright freezer is a solid choice. Offering 18.58 cubic feet of space, you can fill this freezer up with everything from meat to frozen veggies and pizzas. People love how the space is divided with useful drawers, tilt out door shelves, and more. Electrolux’s trademark luxury-glide baskets are the perfect spot to store items that might otherwise slide around or get lost in the shuffle and a deeper drawer holds larger items that you want to keep organized and within reach. Unlike many other models on the market, this upright fridge comes equipped with a built-in icemaker. However, it doesn’t include a door dispenser or water filter, which is an occasional gripe from users. Still, having an integrated ice maker is a big plus for this high-end model. For the maximum in upright freezer storage space, turn to this very large option from GE. The GE FUF21SMRWW is impressive in size; in fact, it measures 6’3” tall and packs in just over 21 cubic feet of space. Most upright freezers top out at about 20 cubic feet, but GE squeezed in an extra 1.3 cubic feet for you to stash a few more steaks or frozen dinners. This model of upright freezer from GE has four wire shelves and one wire basket to keep things sorted and visible. In addition, four door shelves keep smaller items in plain sight. A few people mention that the super strong seal of this model makes the door a little tough to open. Other reviewers are quick to point out that this is not a bad thing if you want to make sure that the cold air stays inside the freezer! Such a large capacity upright freezer may not fit well in your kitchen layout, or you may not want to haul it down to the basement. If you plan to keep it in your garage, you can rest assured that it will perform very reliable in temperatures from 0 degrees to 110 degrees, according to the manufacturer. People that have this oversized upright freezer in their garage report no issues or mishaps with their food storage. This is also a frost-free freezer, so you won’t need to worry about thawing and draining this mammoth appliance. And despite the supersized space, this model doesn’t have a supersized price tag – you can pick up the GE FUF21SMRWW for under $700. For convenience and flexibility, choose an upright freezer that can transition from arctic freeze to a lighter chill for refrigerated perishables with the touch of a button. A popular pick is the sleek-looking Frigidaire Gallery FGVU21F8QF. This convertible upright freezer will hold plenty of frozen or fresh foods in its 20.5 cubic feet of interior space, and the shelves and drawers are well-designed and easy to use according to reviewers. A digital display on the front of the appliance lets you keep tabs on its current temperature settings, though some people wish it would provide you with the current internal temperature instead. One other occasional complaint is that the fan seems to run more than some users expected. Whether you want to use this model from the Frigidaire Gallery family of appliances as an upright freezer or a refrigerator, this unit will look great in your space and keep everything inside cold—thanks in part to its tight door seal. In terms of looks and functionality, it has drawn comparisons to some of the high-end kitchen appliances on the market, for a comparatively low price. Still, the stainless steel finish and flexibility of this convertible upright freezer will cost you more than basic models; expect to pay just over a $1,000 for the good looks and convenience of the Frigidaire Gallery FGVU21F8QF. For an upright freezer with the easy access of double doors, consider the Whirlpool SideKicks Upright Freezer. Offering nearly 18 cubic feet of space and easy access to all shelves and drawers, this shiny stainless steel freezer is big on style and accessibility. The Whirlpool SideKicks side-by-side freezer gives you adjustable shelving, five bins on each door, plus 4 baskets for sorting frozen goods. Open up one or both doors for a good look at what you have frozen for future use. The interior is well-lit according to users, making it simple to see what is stashed away. An electronic temperature control lets you set the level of chill you need for your frozen foods easily. And if the temperature begins to creep out of the safe zone or the door is left open, a built-in alarm will alert you to the situation. Described as almost having a commercial-like quality, this upright freezer will let you store food and meal prep like a gourmet chef in your own kitchen. The double door design gives the appliance a high-end feel and many people appreciate how easy it is to see everything inside at a glance. Choose the SideKicks double door upright freezer if you’re looking for a custom appliance look or the easy access that a French door freezer offers. If you don’t want to take a chance with the ups and downs of automatic defrosting cycles, then consider an upright freezer with manual defrost. The Frigidaire FFFU17M1QW offers a simple defrosting process and plenty of space to stash away frozen foods. This model from Frigidaire has 17.4 cubic feet of storage space inside, which isn’t as much as some large capacity upright freezers but is plenty for the average household. Inside the freezer, you’ll find basic organization – 3 wire shelves and 5 door shelves to keep things in place. There are no drawers or adjustable shelves inside this freezer, but people find the space to be adequate and useful. A green indicator light at the bottom of the appliance serves as an easy indicator that the freezer is operational and keeping things cold. What people really like about this upright freezer its ultra thick walls and tight door seal to keep cold temps in and warm air out. The manufacturer claims that the ArcticLock walls of this upright freezer will keep food frozen for up to 2 days in the event of a power less. When it comes time to defrost the freezer, users say that the manual defrost process is simple and quick. Instead of worrying about the freezer automatically defrosting and exposing frozen goods to fluctuating temperatures, manually tackling the task lets you control when and how the freezer defrosts. Do you keep your upright freezer in the garage? Instead of it looking like an appliance after-thought, consider this model that is built to be durable and portable—making it the perfect choice in an upright freezer for garages. The Gladiator Upright Rolling Garage Freezer features a black matte finish and a unique step-to-open door. Users comment on how convenient it is to open up the fridge using the stainless steel foot pedal when you have your arms full of groceries ready to be stocked inside. Adding to the functionality of this garage-ready upright freezer is the fact that it sits on four heavy-duty casters. Reposition the freezer easily if you need to use the space for other storage needs or a special project. Inside, you’ll find heavy-gauge wire shelves and baskets with adjustable positions to store and sort frozen goods. Door shelves and bins keep smaller goods within easy reach. All in all, there is 17.8 cubic feet of space available for food storage. And while there isn’t custom temperature control, three settings are available to keep your food chilled to the right level. People consistently comment on the deep freeze and cold temperatures available from this freezer. If you want an upright freezer for the garage, this Gladiator model is the clear winner. If you’re looking for a compact upright freezer, check out this space-saving model from Midea. With 3.0 cubic feet of space, this small but mighty upright freezer keeps about 105 pounds of groceries in a deep freeze. This free-standing upright freezer measures just under 3 feet tall and has adjustable legs and a reversible door to fit into your small space. Available in black, white, or a stainless steel finish, this appliance can blend into any décor. It’s great for dorm rooms, apartments, office use, or anywhere else that you need a deep freeze in a small space. People are generally pleased with the amount of storage space offered in this compact freezer. Most people find it useful for one or two people, and it’s energy-efficient as well. Some buyers had issues with the appliance arriving dented, so that is something to be aware of. You should also know that there is no actual thermometer reading inside the Midea WHS-109FB1, but the temperature is adjustable on a scale from 1 to 6—offering enough adjustability to get the setting just right for your needs.